Sade ("sha-day") was born with the name Helen in Nigeria to a British mother and Nigerian father. The name "Helen" being alien to Nigerian ears, they called her "Sade", a variant of her middle name. Her parents divorced when she was an infant, her mother raising her in Britain. Sade worked as a model and fashion designer for several years, and was involved in designing outfits that Spandau Ballet wore on their first American tour. But her heart was in music, and at age 21 Sade joined Arriva, a Latin-influenced funk group, and co-wrote "Smooth Operator" with the band's guitarist, Ray St. John. Without a recording contract, though, the tune was heard only in nightclubs where Arriva performed. In 1981, Sade joined Pride, an eight-person funk band, starting as a background singer but eventually being featured more prominently. When offered a record contract, she took three members of Pride with her. They formed a new band, also called Sade, and she convinced the record company that they could not sign Sade the singer without signing Sade the band -- guitarist/saxophonist Stuart Matthewman, keyboardist Andrew Hale, and bassist Paul Denman. Sade's first album, Diamond Life, included "Smooth Operator", which stayed on American charts a phenomenal 81 weeks. Sade's later hits have included "Paradise", "Nothing Can Come Between Us", and "Keep Looking", "The Sweetest Taboo", "Hang on to Your Love", "No Ordinary Love", and "Pearls". 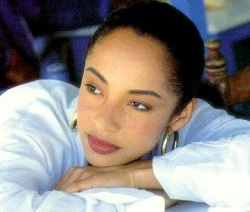 Sade the singer stayed out of the limelight for a few years after her daughter was born in 1996. In 1998, she was charged with reckless driving in Jamaica. Sade's three bandmates have performed and recorded without Sade as Sweetback.